Analyze the various "first contacts" as presented by Horwitz. How would you begin to assess the gender relations here? To what extent can we recover the encounter from the perspective of "the discovered," that is from the perspective of the natives, instead of merely from the perspective of Captain Cook himself or the aristocratic naturalist Joseph Banks? How is Captain Cook remembered in the various places visited by Tony Horwitz? Identify and compare individuals and groups as you follow Cook and Horwitz to such places as Tahiti, Bora-Bora, New Zealand, Australia, Niue, Tonga, Britain, Alaska and Hawaii. How would you account for the differences in interpretation here. Who, in your opinion, are the three people that Horwitz meets in his journeys who have the most interesting things to say about Cook and his legacies? What is most distinctive about these three? How and why has the meaning of Cook's voyages been reinterpreted by various groups over time? How is it possible that he can mean such different things to different people? Describe Cook's voyages as portrayed by Horwitz. What are some of the things you learned about the eighteenth century world through an intensive examination of these three expeditions? How would you begin to assess the meaning of the "encounter" between Europeans and Polynesians as signaled by Cook's voyages? To what extent was there a "Pacific of the imagination?" What could the South Pacific represent to Europeans of Cook's era and how important were these preconceptions in influencing history? Who was Captain Cook? What was his historical significance? What was most interesting about his background? To what extent is it worthwhile to study him today? What traces of Cook's footprints remain in the lands that he visited? Is it surprising that Cook is not that much better remembered today than is indeed the case? If so, how would you begin to explain this? Historian Bernard Smith on Cook: "More than any other person, he helped to make the world one." Respond. Horwitz: "One of the small ironies of Cook's voyages is that a man who charted and named more of the world than any other navigator in history has few places of consequence named in his honor. Magellan and Bering were honored with famous straits and seas; Hudson merited a major river and bay. Columbus garnered ten American cities, including the U.S. capital ("Columbia" is a feminized version of "Columbus"), as well as a national holiday. Cook came away with two glaciers, several remote passages, inlets and peaks, a tiny island group he barely visited, and crater on the moon." Comment. What are the strengths and weaknesses of Horwitz's approach to the study of the past? What is gained and what is lost in comparison to a more traditional history? Research a little about the history of Captain Cook in Nootka Sound on his third voyage. Fold this information into your overall analysis. Blue Latitudes: An hour-long interview with Tony Horwitz from December 31, 2002. 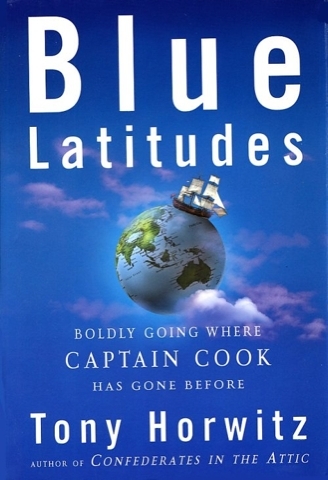 Blue Latitudes: A short NPR interview with Horwitz about his book.